What games are students playing and where? What sort of boundaries or systems for organizing play do the students already have in place? Are games in the safest space for the activity? For instance, are kids playing tag where there may be tripping hazards? A little bit of planning can go a long way to organize your recess so that there’s less chaos and more fun. 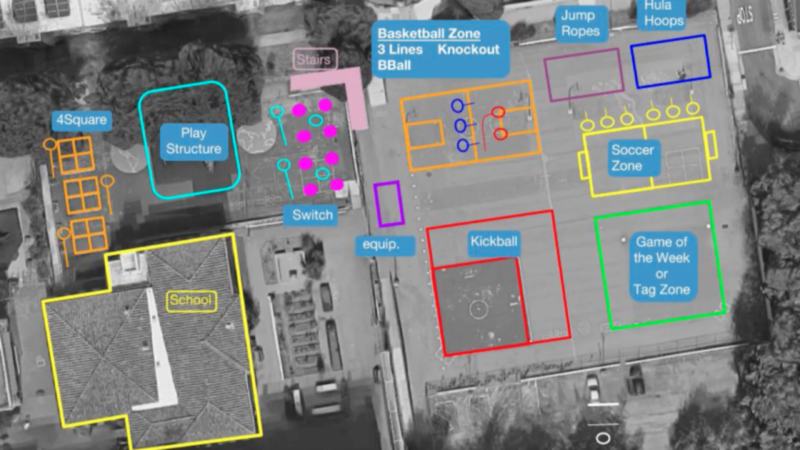 By mapping your playground, you can ensure that students are able to find and join the activities that are right for them and that everyone has a safe and relaxed recess. Find an aerial photo or print one from Google showing your playground from above. Mark the position of any stairs as well as your equipment storage area. Rotational games like four square and Switch don’t require as much space—it’s helpful to locate these to one side or in a corner of the playground. Assign a dedicated area for independent activities like hula-hooping or jumping rope, out of the path of larger group games. Define a large open area with set boundaries for bigger group games, like Three-Lines Basketball, Three-Lines Soccer, or kickball—away from a busy street or any area where it may be unsafe to retrieve a ball. Check for adequate outfield space so kicked balls do not end up in other games. Designate a “Tag Zone” or “Game of the Week” in a flexible play area for larger group games. Different games cater to different kids’ strengths, so it’s good to switch it up. Orient games so balls or other equipment are least likely to interrupt other students or games if they bounce out of the area. Create real but flexible boundaries on the playground for each game area. Post your finalized map outside at kids’ eye-level. Observe your playground and notice where kids have already set boundaries. Print out an aerial photo of your playground and begin to map games to spaces. Share this process with your principal or recess staff. Last year we did not see the structure of the playground that needs to be in place. It is so amazing to see all the great things that can happen when everything is laid out. Before designing your playground map, check out these best practices and tips. Use this worksheet to begin mapping out your playground.